Ireland have included 12 uncapped players in their 30-strong squad for the Women's Six Nations Championship. The Irish won the competition for the first time in 2013, when they achieved the Grand Slam, and were fourth in last year's World Cup. The squad was named by Anthony Eddy, who was appointed Director of Women's Rugby last year, with Tom Tierney succeeding Philip Doyle as head coach. Ireland are away to Italy in their first match on 6 February. They go into the championship without their long-serving skipper Fiona Coghlan, who retired last year after winning 85 caps. The school teacher led the women in green to that famous Grand Slam as well as a memorable victory over a powerful New Zealand team at the 2014 World Cup in France. Seven players included in the squad are involved with the Ireland Sevens set-up, including Nicole Cronin, Katie Fitzhenry, Sene Naoupu, Hannah Tyrrell and Megan Williams. "We have had a number of camps over the past few weeks and have had to make some tough choices in reducing the squad to 30 players," said Eddy, who took on the Ireland job after a spell as General Manager of Rugby Sevens in Australia. "It is a new dawn for the women's team with a new coaching set-up, including head coach Tom Tierney, and 12 uncapped players named in the squad. "That we can bring in this new talent is testament to the work done previously." Ireland will play a warm-up game against Wales on Sunday in Ashbourne. 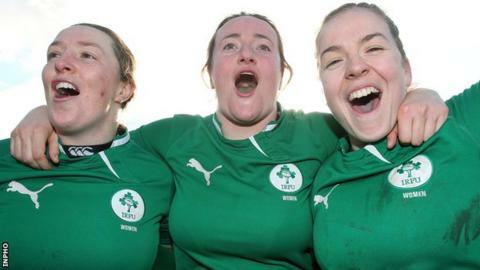 Ireland squad: Gillian Bourke (Olympico de Pozzuol), Niamh Briggs (UL Bohs), Kerrie-Ann Craddock (Saracens), Nicole Cronin (Shannon), Jeamie Deacon (Blackrock), Emma Dunne (Old Belvedere), Ailis Egan (Old Belvedere), Katie Fitzhenry (Blackrock), Paula Fitzpatrick (St Mary's), Orla Fitzsimons (St Mary's), Fiona Hayes (UL Bohs), Alison Miller (Portlaoise), Sarah Mimnagh (Wasps), Claire Molloy (Bristol), Larissa Muldoon (Skewen), Jenny Murphy (Old Belvedere), Sene Naoupu (Galwegians), Katie Norris (Blackrock), Heather O'Brien (Highfield), Fiona O'Brien (Old Belvedere), Elise O'Byrne-White (Old Belvedere), Ruth O'Reilly (Galwegians), Marie-Louise Reilly (Old Belvedere), Tania Rosser (Blackrock), Jackie Shiels (Richmond), Sophie Spence (Old Belvedere), Nora Stapleton (Old Belvedere), Hannah Tyrrell (Old Belvedere), Megan Williams (St Mary's), Jade Wong (Richmond).